« Are you happy when you’re right or when you’re wrong? And so it goes in the ‘Assemble Mr. Potato Head’ collaborative team building activity. One person is blindfolded, the other team members look at a picture and tell the blindfolded person what piece to pick up and where to put it to replicate what’s on the picture. 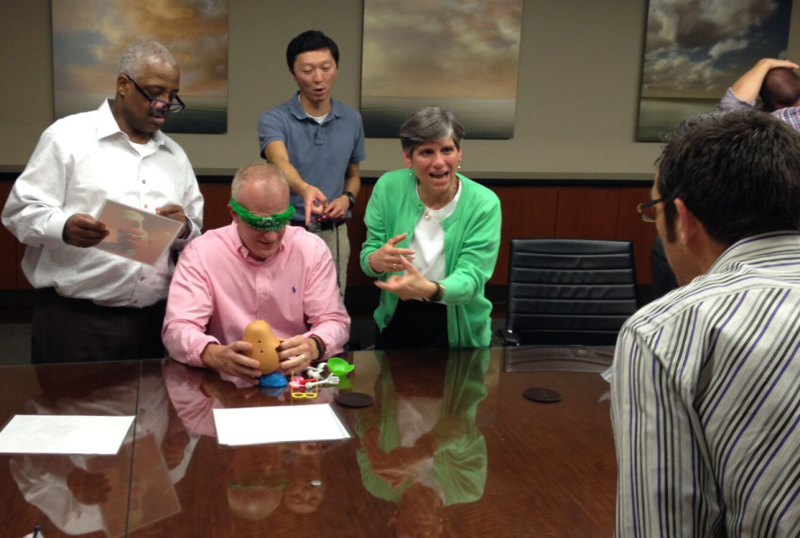 It’s a fun activity, and great for honing team communication. The attempts and results that teams experience in collaborative team building activitiesare often predictable for me – I’ve seen it all (almost). Yet part of what I love about this work is unexpected innovation. blindfolded person where a certain piece is and then where it goes. This time, they let the blindfolded person pick any piece at random, then told them where it went. Every piece was ‘the right one to pick up’. The person without sight is given a 100 on the test. The most vulnerable person is in charge, is ‘right’. This is a simple tweak of genius. If we want to influence someone to do what you want them to do, if we want to change the world, we start where the other person is, not where they should be. We visit them in their “home”, their most comfortable way of doing things. We tolerate our discomfort in the service of change. Brain science tells us this is true for the brain as well. If we want to help an emotionally hijacked person out of it, the first step is to meet them, without fear, in the hell they have entered. Then we can show them the way out. This entry was posted in Purpose. Bookmark the permalink. Both comments and trackbacks are currently closed.